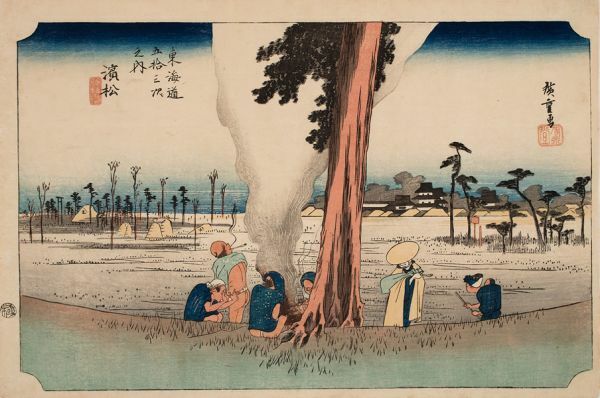 Utagawa Hiroshige (1797-1858)- The Otsuki Plain in Kai Province (Kai otsukigahara). 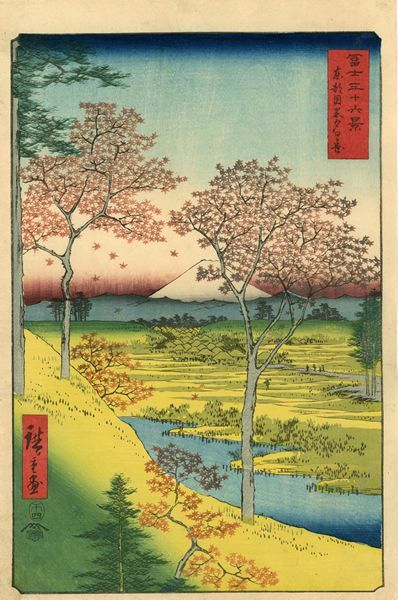 From the seriesFuji sanjurokkei (Thirty-six Views of Mt. Fuji). 1858. Oban. 37.3 x 25.3 cm. Van Vleck page 109. Fine, early impression. Fine colour and condition with large margins. Utagawa Hiroshige (1797-1858)- No. 4. Kambara, Yoshiwara, Hara, Yui, Okitsu. From the series Tokaido harimaze zue (Harimaze Pictures for the Tokaido). Circa 1852. Oban. Van Vleck page 177. Fine, early impression with strong wood-grain. Fine colour. Very good condition. 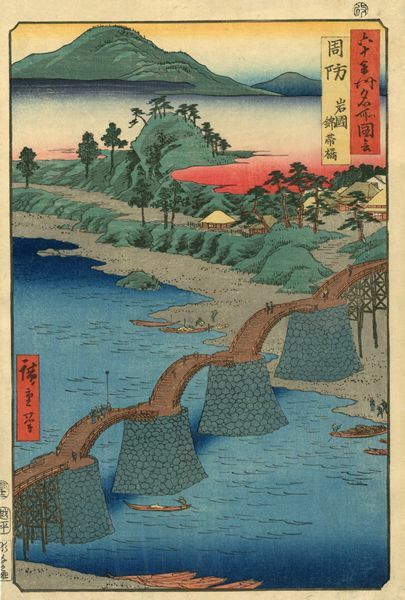 Utagawa Hiroshige (1797-1858)- The Brocade Bridge at Iwakuni in Suo Province(Suo iwakuni kintaibashi). 1855. Oban. 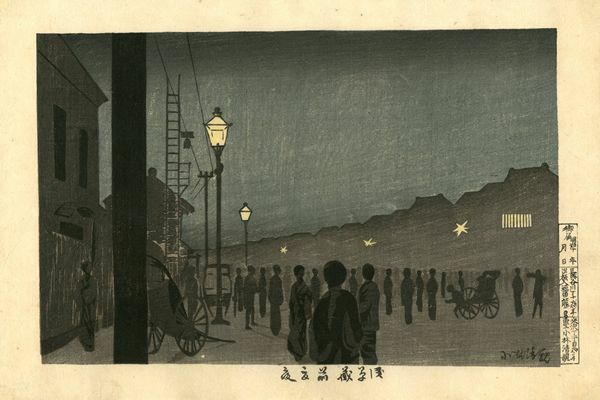 From the series Rokujuyoshu meisho zue (Pictures of Famous Places in the Sixty Odd Provinces). 1853. Oban. Van Vleck page 100. Fine impression, colour and condition. Utagawa Hiroshige (1797-1858)- Waka Bay in Kii Province (Kii wakanoura). 1855. Oban. From the series Rokujuyoshu meisho zue (Pictures of Famous Places in the Sixty Odd Provinces). 1855. Oban. Van Vleck page 100. Fine impression with blind-printing in the feathers of the birds. Fine colour. Very good condition. 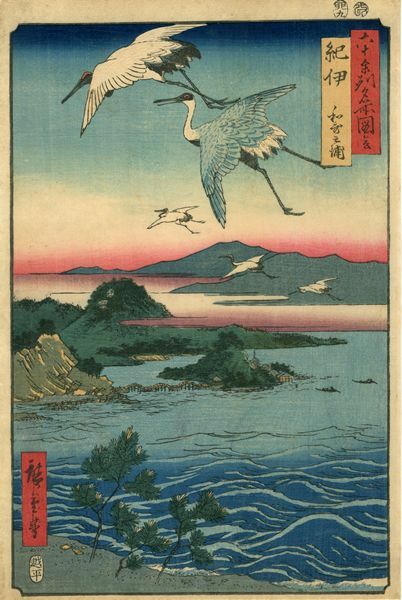 Utagawa Hiroshige (1797-1858)- Okitsu. The Poet Yamabe no Akahito. From the series Tokaido gojusan tsui (Fifty-three Pairings for the Tokaido Road). Mid-1840. Robinson S44-18. Fine, early impression. Fine colour and condition. 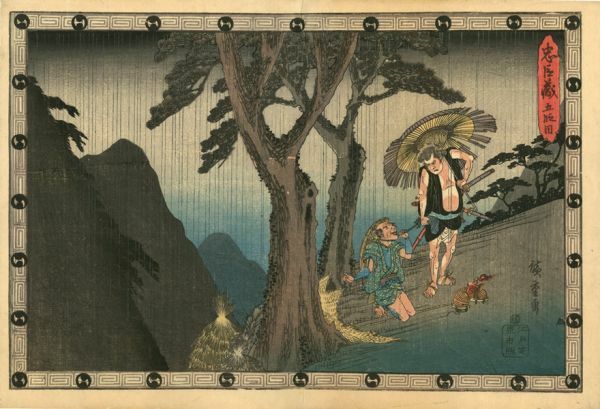 Utagawa Hiroshige (1797-1858)- Yochibei Robbed by Sadakuro in Heavy Rain on the Road from Kyoto to Yamazaki. Act 5 (Godanme). From the series Chushingura (The Storehouse of Loyal Retainers). Mid-1830. Oban. Van Vleck page 186. Tamba 431. Fine impression, colour and condition. 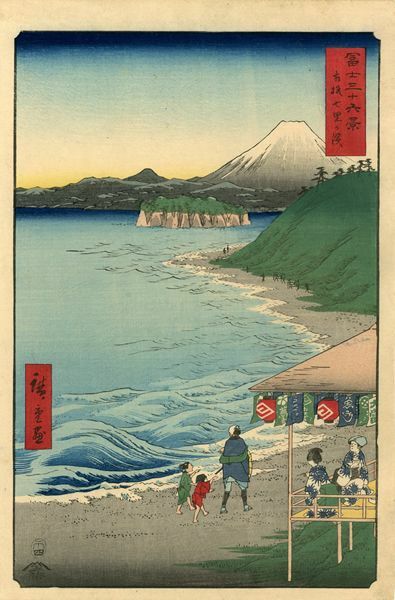 Utagawa Hiroshige (1797-1858)- Takeshi Beach in Izumi Province (Izumi takashinohama). From the series Rokujuyoshu meisho zue (Pictures of the Famous Places in the Sixty-odd Provinces). 1853. Oban. Van Vleck page 95. Fine impression with strong woodgrain. Fine colour and condition. 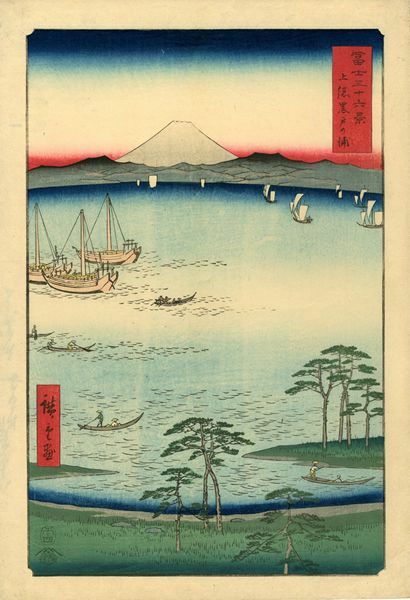 Utagawa Hiroshige (1797-1858)- Off Tsukuda Island in the Eastern Capital (Toto tsukudajima oki). 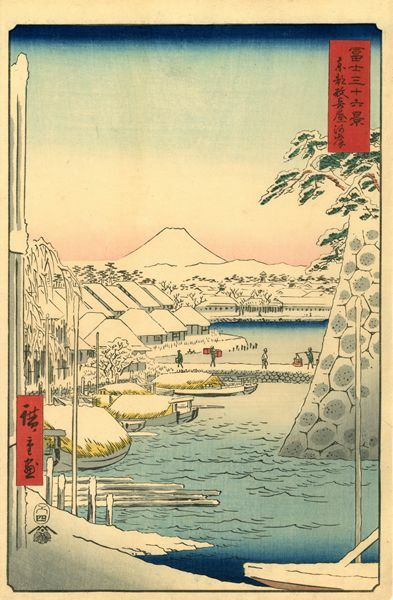 From the series Fuji sanjurokkei (Thirty-six Views of Mt. Fuji). 1858. Oban. Van Vleck page 107. 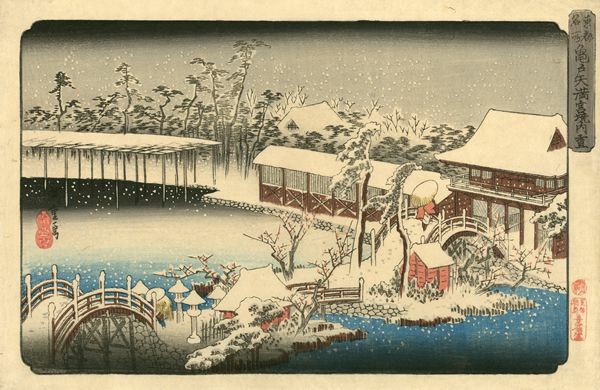 Utagawa Hiroshige (1797-1858)- Bikuni Bridge in Snow (Bikunibashi setchu). 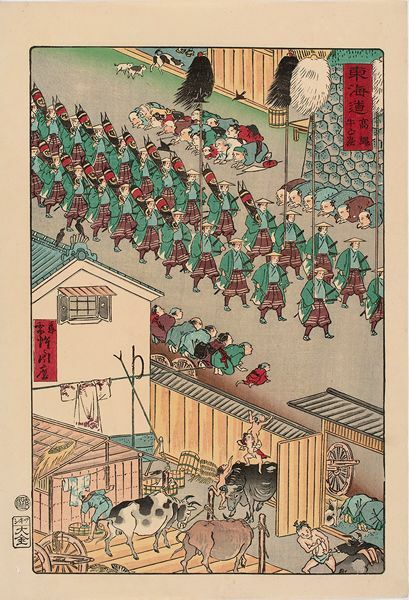 From the series Edo meisho hyakkei (One Hundred Views of Famous Places in Edo). 1858. Oban. 35.6 x 23.5 cm. Van Vleck page 135, UTK/17/114, Smith 114. Fine impression of the first edition with strong wood-grain on thick paper. Fine colour. Faint centrefold. Otherwise, fine condition. 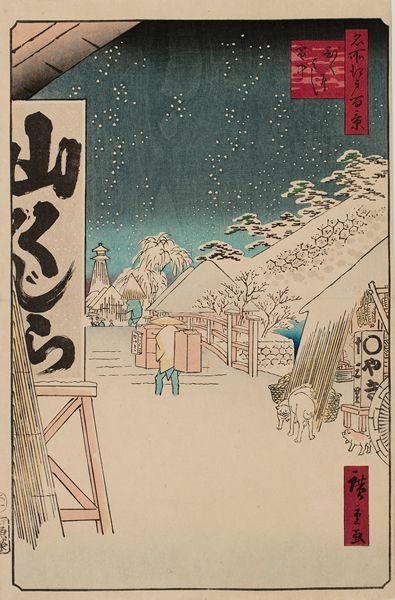 Utagawa Hiroshige (1797-1858)- Kinryuzan Temple, Asakusa (Asakusa kinryuzan). From the series Edomeisho hyakkei (One Hundred Views of Famous Places in Edo). 1856. Oban. 36.5 x 24.8 cm. Van Vleck page 134, UTK/17/99, Smith 99. Fine impression of the second edition. Fine colour and condition. 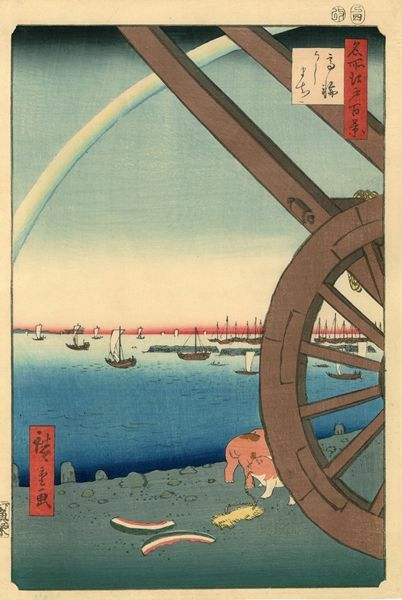 Utagawa Hiroshige (1797-1858)- Clouds of Dawn at Nihon Bridge (Nihonbashi toun no kei). From the series Gojusantsugi meisho zue (Pictures of Famous Places on the Fifty-three Stations). 1855. Oban. Van Vleck page 64. Fine, early impression with woodgrain. Fine colour and condition. 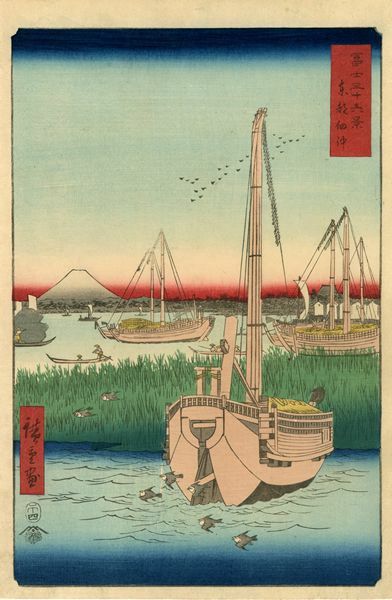 Utagawa Hiroshige (1797-1858)- Ushimachi, Takanawa. 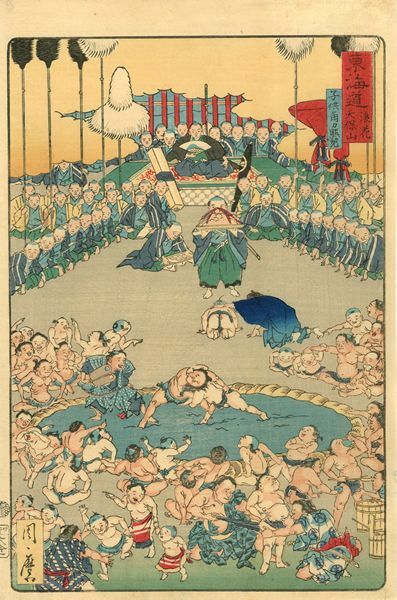 From the series Edo meisho hyakkei (One Hundred Famous Views of Edo). 1857. Oban. Smith 81. Fine impression, colour and condition. 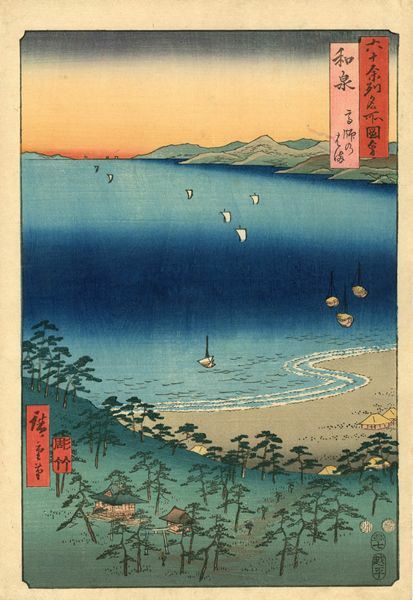 Utagawa Hiroshige (1797-1858)- Seven Ri Beach in Sagami Province (Soshu shichirigahama). 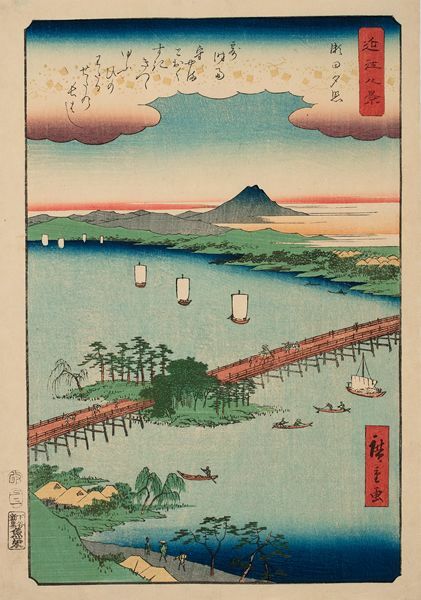 From the series Fuji sanjurokkei (Thirty-six Views of Mt. Fuji). 1858. Oban. Van Vleck page 108. Fine impression, colour and condition. Utagawa Hiroshige (1797-1858)- No. 18. The Sagami River (Sagamigawa). 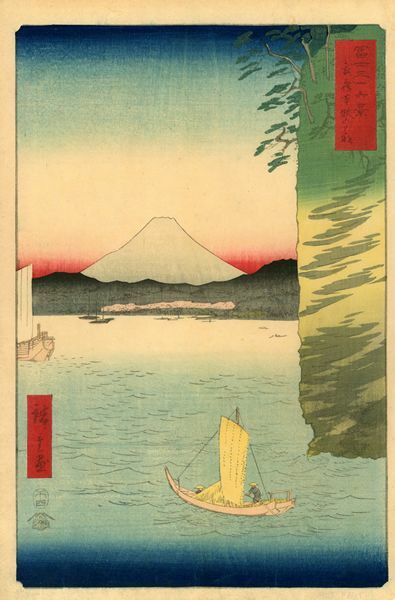 From the series Fuji sanjurokkei (Thirty-six Views of Mt. Fuji). 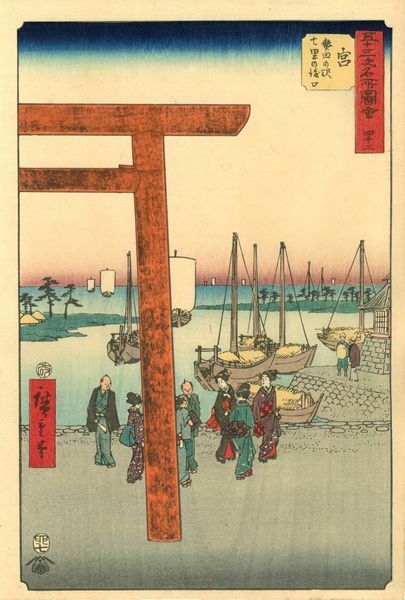 Utagawa Hiroshige (1797-1858)- Teppozu and Tsukiji Honganji Temple (Teppozu Tsukiji Monzeki). 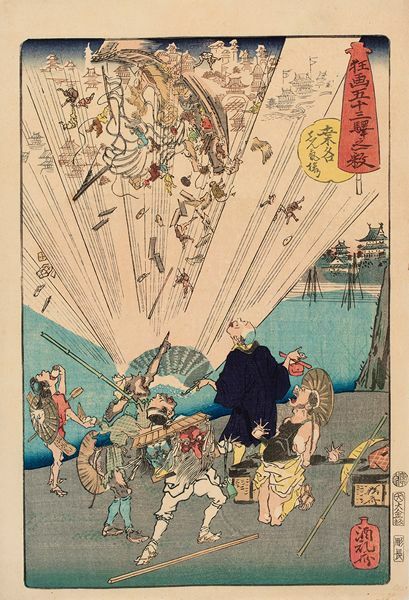 From the series Edo meisho hyakkei (One Hundred Famous Views of Edo). 1858. Oban. Smith 78. Fine impression, colour and condition. Utagawa Hiroshige (1797-1858)- The Basket Ferry in Hida Province (Hida kagowatashi). 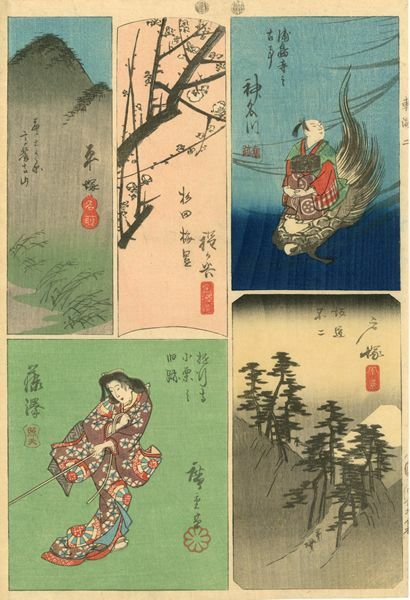 From the series Rokujuyoshu no meisho zue (Pictures of the Famous Places in the Sixty-odd Provinces). 1853. Oban. Van Vleck page 97. Fine impression and colour. Very good condition. Utagawa Hiroshige (1797-1858)- Changing Porters and Horses at Fujieda (Fujieda jimba tsugitate). From the series Fifty-three Stations of the Tokaido Road , the so-called, Hoeido Tokaido(Tokaido gojusantsugi no uchi). 1833. Oban. Van Vleck page 33. Fine, early impression on luxurious paper. Fine colour. Top right corner replaced. Narrow margin at left. Otherwise, fine condition. 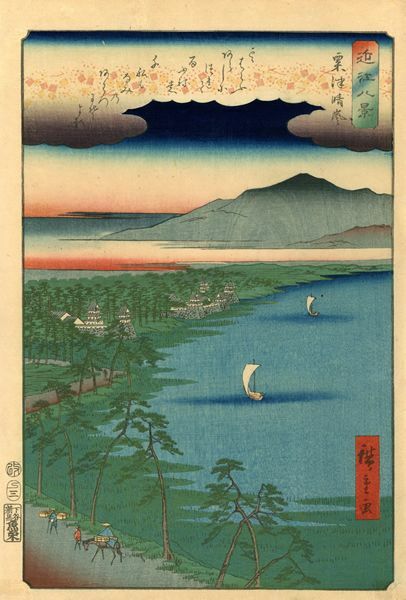 Utagawa Hiroshige (1797-1858)- Haze on a Clear Day at Awazu (Awazu no seiran). 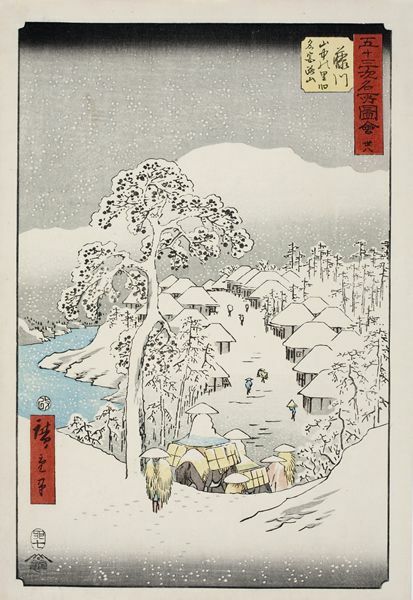 From the series Omi hakkei (Eight views of Omi Province). 1857. Oban. Van Vleck page 83. Fine impression of the first edition. Fine colour. Restored paper losses in top and right margins. 1855. Oban. Van Vleck page 70. Fine, early impression with strong woodgrain and dramatic oxidation.Fine colour and condition. 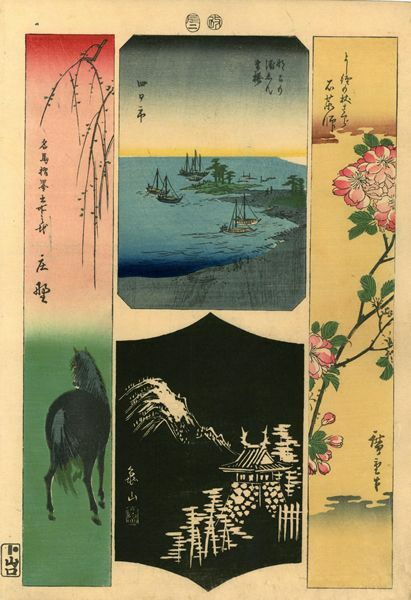 Utagawa Hiroshige (1797-1858)- No. 21. Lake at Hakone (Hakone no kosui). 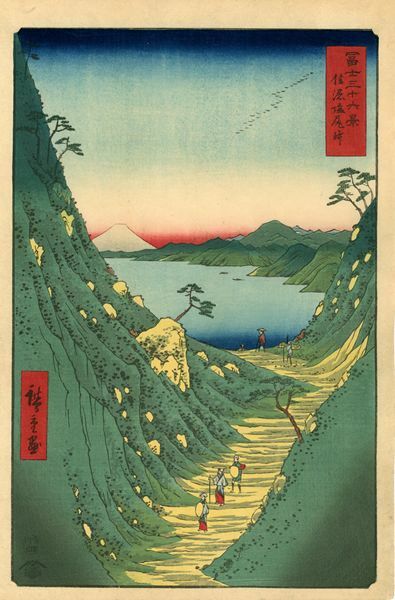 From the series Fuji sanjurokkei (Thirty-six Views of Mt. Fuji). Utagawa Hiroshige (1797-1858)- No. 15. Noge and Yokohama in Musashi Province (Musashi noge Yokohama). 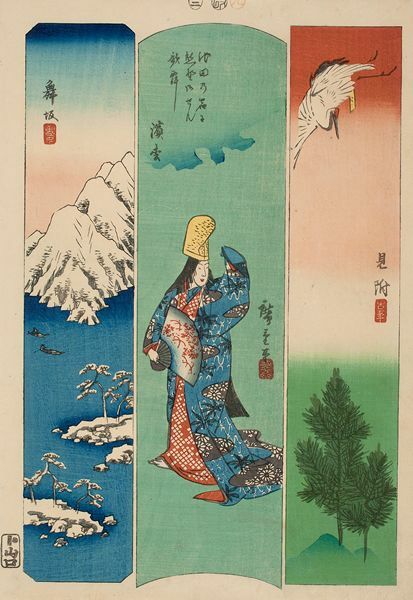 From the series Fuji sanjurokkei (Thirty-six Views of Mt. Fuji). 1858. Oban. Van Vleck page 107. Fine impression, colour and condition. Utagawa Hiroshige (1797-1858)- Festival at the Itsukushima Shrine in Aki Province (Aki Itsukushima sairei no zu). 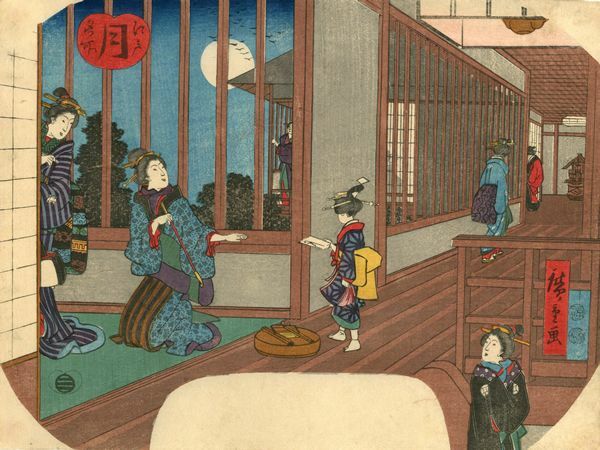 From the series Rokujuyoshu no meisho zue (Pictures of Famous Places in the Sixty-odd Provinces). 1853. Oban. Van Vleck page 99. Fine impression and colour. Very good condition. 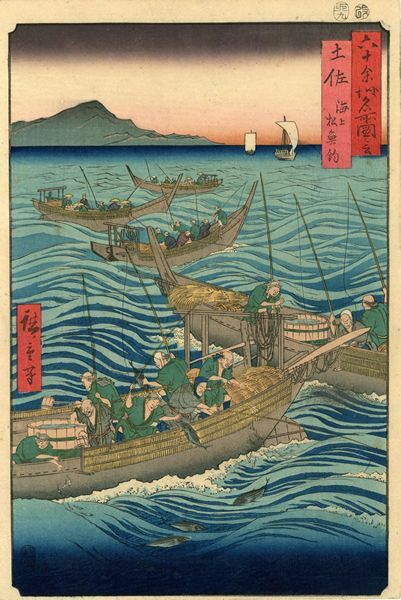 Utagawa Hiroshige (1797-1858)- Fishing for Bonito off the Coast of Tosa Province (Tosa kaijo katsuozuri). 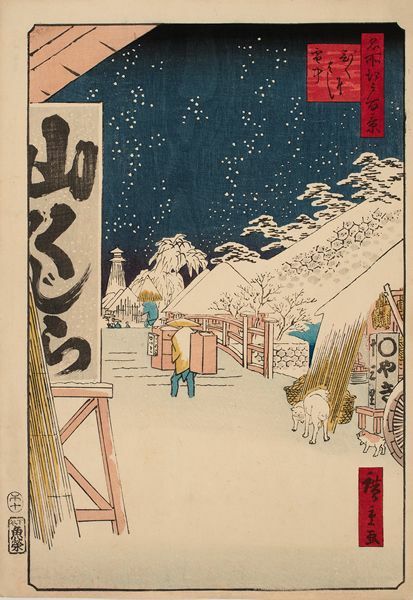 From the series Rokujuyoshu no meisho zue (Pictures of the Famous Places in the Sixty-odd Provinces). 1853. Oban. Van Vleck page 100. Fine impression of the first edition. Fine colour. Narrow margin at bottom, otherwise fine condition. 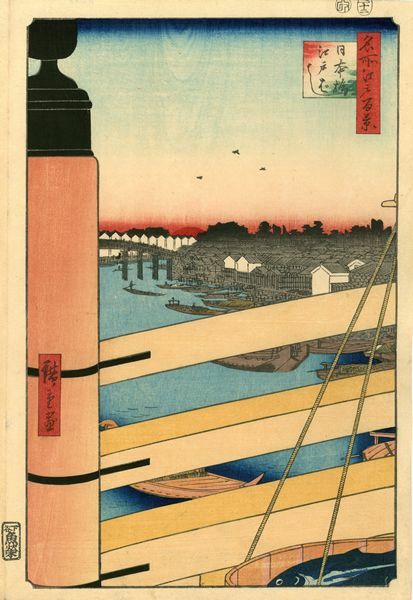 Utagawa Hiroshige (1797-1858)- Nihonbashi Bridge and Edobashi Bridge (Nihonbashi Edobashi). From the series Edo meisho hyakkei (One Hundred Famous Views of Edo). 1857. Oban. Smith 43. Fine impression, colour and condition. 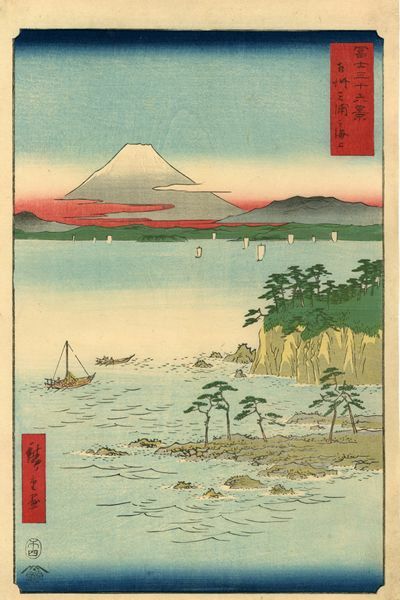 Utagawa Hiroshige (1797-1858)- Kuroto Bay in Kazusa (Kazusa kuroto no ura). 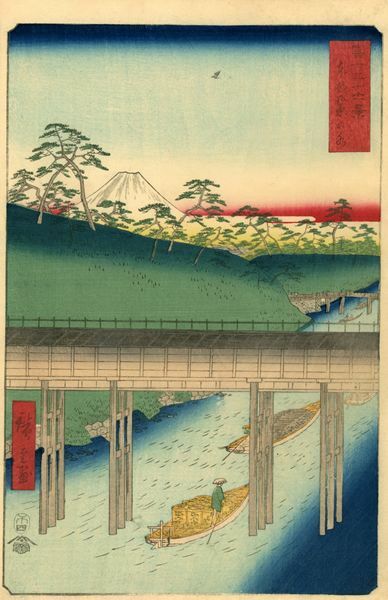 From the series Fuji sanjurokkei (Thirty-six Views of Mt. Fuji). 1858. Oban. Van Vleck page 109. Fine impressionwith unusually large margins. Fine colour and condition. 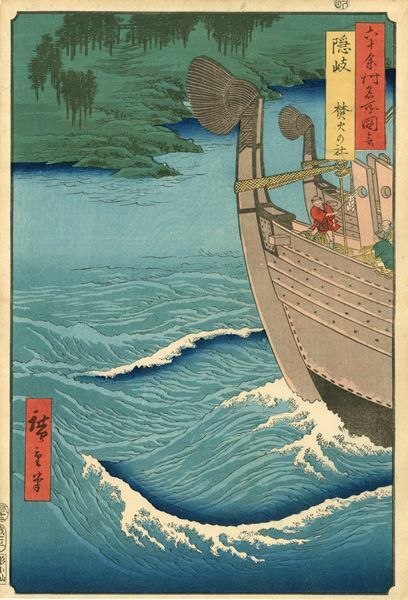 Utagawa Hiroshige (1797-1858)- The Sea off the Miura Peninsula in Sagami Province (Soshu miura no kaijo). 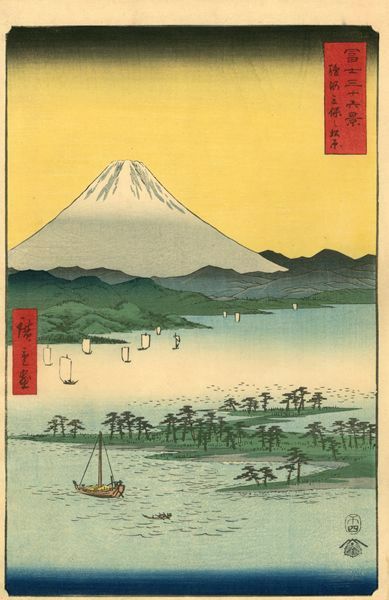 From the series Fuji sanjurokkei (Thirty-six Views of Mt. Fuji). 1858. Oban. Van Vleck page 107. Fine, early impression with strong woodgrain. Fine colour and condition. Utagawa Hiroshige (1797-1858)- No. 3. Sukiyagashi in the Eastern Capital (Toto sukiyagashi). 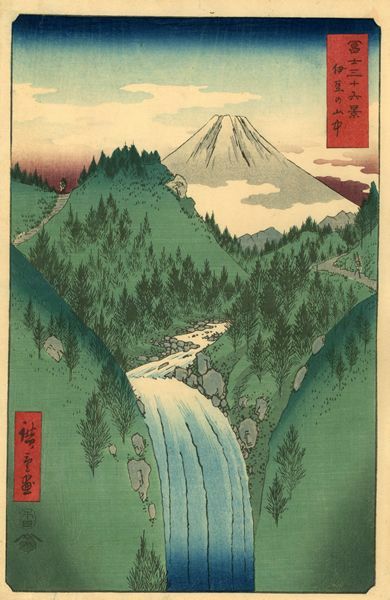 From the series Fuji sanjurokkei (Thirty-six Views of Mt. Fuji). 1858. Oban. Van Vleck page 106. Fine impression and colour. Very good condition. Utagawa Hiroshige (1797-1858)- No. 22. The Izu Mountains (Izu no sanchu). 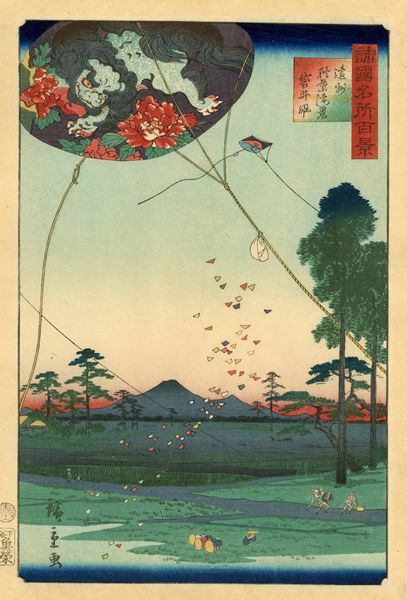 From the series Fuji sanjurokkei (Thirty-six Views of Mt. Fuji). Utagawa Hiroshige (1797-1858)- No. 24. The Pine Forest of Mio in Suruga Province (Suruga mio no matsubara). 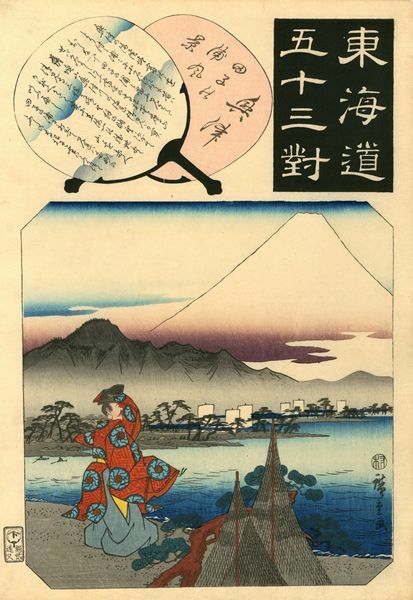 From the series Fuji Sanjurokkei (Thirty-six Views of Mt. Fuji). Oban. 35.8 x 24.2 cm Van Vleck page 135, UTK/17/114, Smith 114. Fine impression with strong wood-grain. Fine colour and condition. Utagawa Hiroshige (1797-1858)- No. 20. The Entrance Gate at Enoshima in Sagami Province (Soshu enoshima iriguchi). 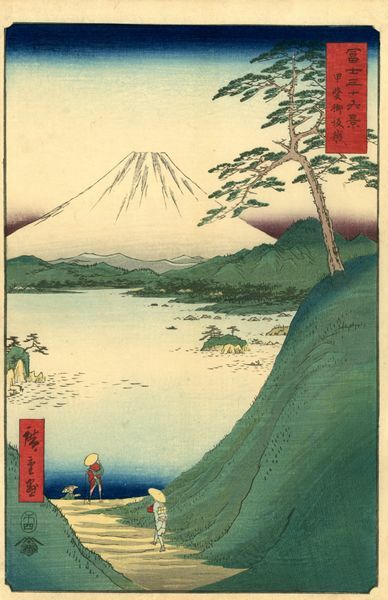 From the series Fuji sanjurokkei (Thirty-six Views of Mt. Fuji). 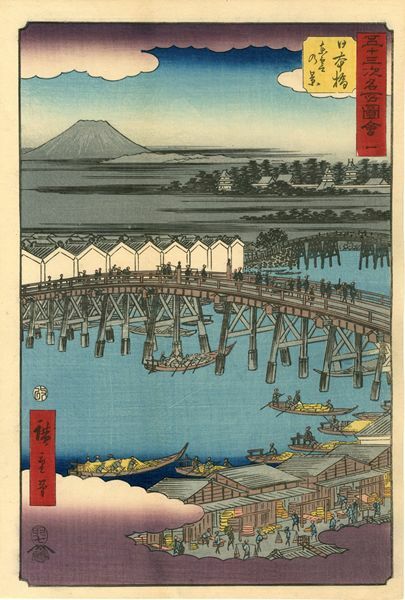 Utagawa Hiroshige (1797-1858)- Ryogoku in the Eastern Capital (Toto ryogoku). 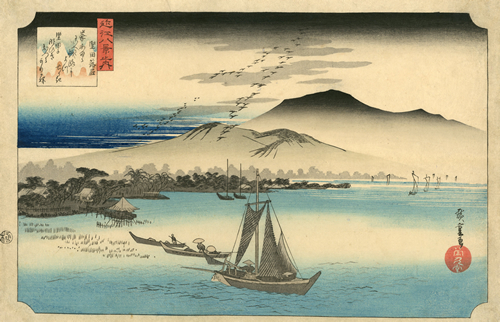 From the series Fuji sanjurokkei (Thirty-six Views of Mt. Fuji). 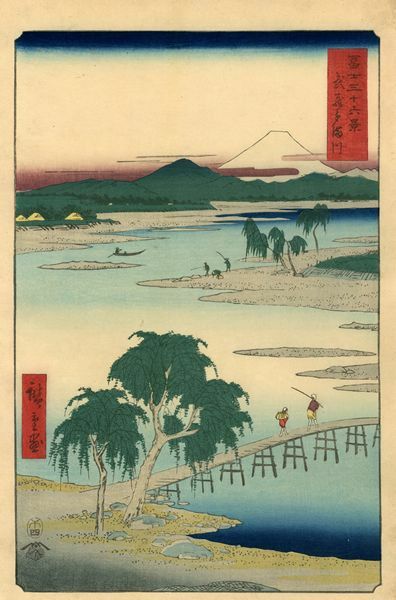 Utagawa Hiroshige (1797-1858)- No. 12.Koganei in Musashi Province (Musashi koganei). 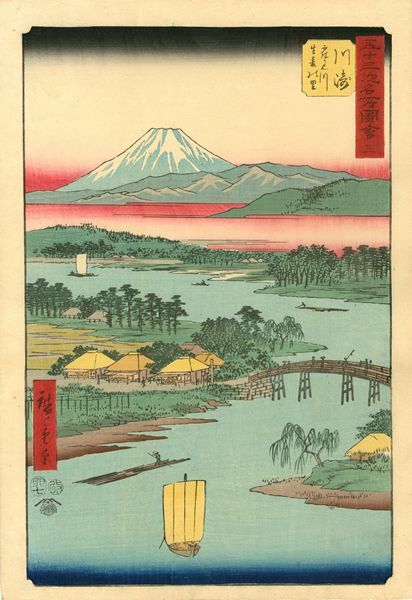 From the series Fuji sanjurokkei (Thirty-six Views of Mt. Fuji). Utagawa Hiroshige (1797-1858)- No. 27. Futami Bay in Ise Province (Ise futamigaura). 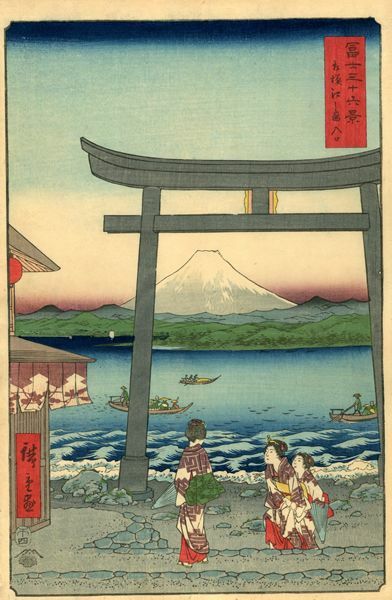 From the series Fuji sanjurokkei (Thirty-six Views of Mt. Fuji). 1858. Oban. Van Vleck page 109. Fine impression, colour and condition. 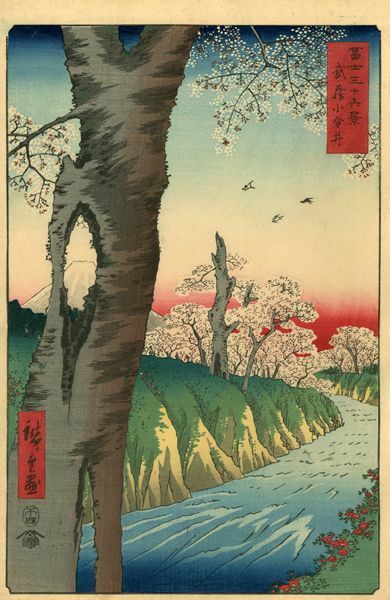 Utagawa Hiroshige (1797-1858)- Cherry Blossoms at Hommoku in Musashi Province (Musashi hommoku no hana). 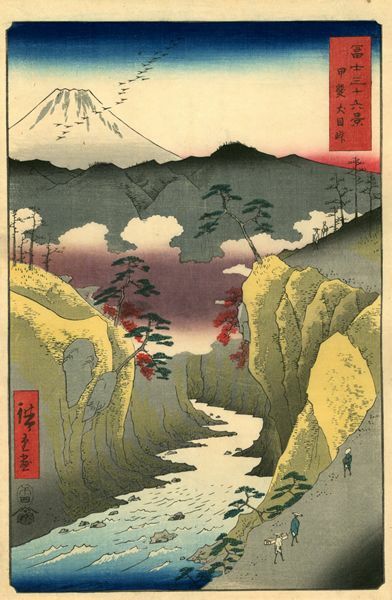 From the series Fuji sanjurokkei (Thirty-six Views of Mt. Fuji). Utagawa Hiroshige (1797-1858)- No. 5. Ochanomizu in the Eastern Capital (Toto ochanomizu). 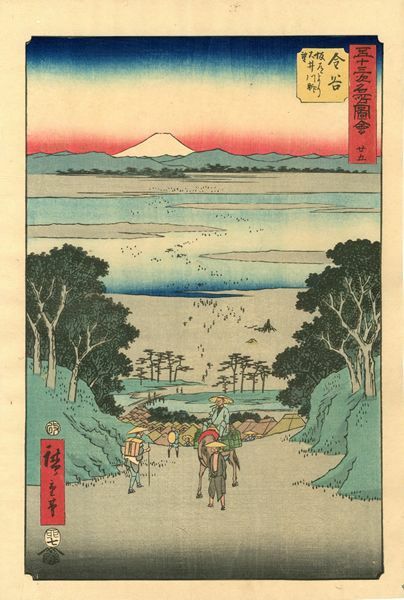 From the series Fuji sanjurokkei (Thirty-six Views of Mt. Fuji). 1858. Oban. Van Vleck page 106. Fine impression, colour and condition. 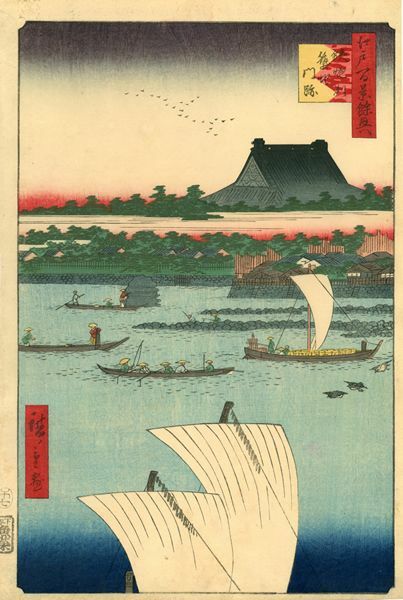 Utagawa Hiroshige (1797-1858)- The Tama River in Musashi Province (Musashi tamagawa). 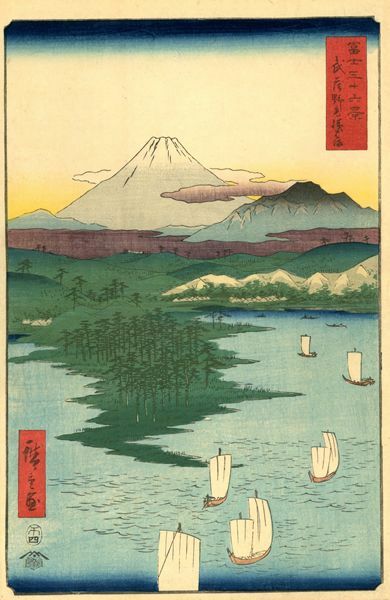 From the series Fuji sanjurokkei (Thirty-six Views of Mt. Fuji). 1855. Oban. Van Vleck page 64.Fine impression, colour and condition. 1855. Oban. Van Vleck page 67. Fine impression with large margins and strong woodgrain. Fine colour and condition. 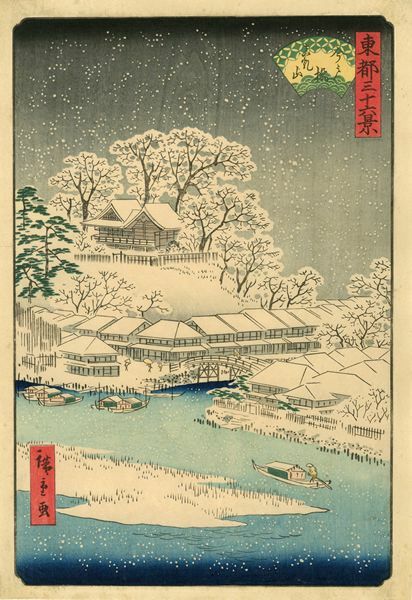 Utagawa Hiroshige (1797-1858)- Winter Desolation at Hamamatsu (Hamamatsu fuyugare noza). From theseries Tokaido gojusan tsugi no uchi (Fifty-three Stations of the TokaidoRoad). Hoeido Tokaido. 1833. Oban. 24.8 x 37.1 cm. Van Vleck page 34, Suzuki (2004) no. 30, UTK/14/30/ Fine impression, colour and condition. Utagawa Hiroshige (1797-1858)- Evening Glow at Seta (Seta no sekisho). 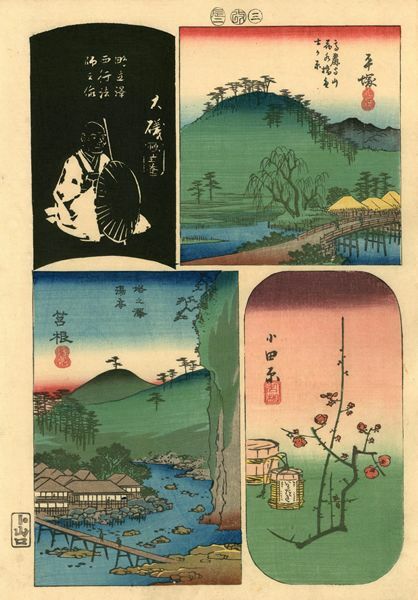 From the series Omi hakkei(Eight Views of Omi Province). 1857. Oban. 36.4 x 25.5 cm. Van Vleck page 83. Fine impression, colour and condition. 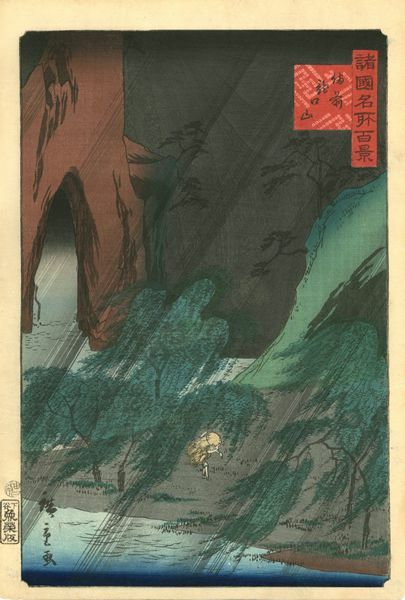 Utagawa Hiroshige (1797-1858)- Yoro Waterfall in Mino Province (Mino yoro no taki). From the series Rokujuyoshu meisho zue (Pictures of Famous Places in the Sixty-odd Provinces). 1853. Oban. Van Vleck page 97. Fine impression with strong woodgrain. Fine colour. Very good condition. 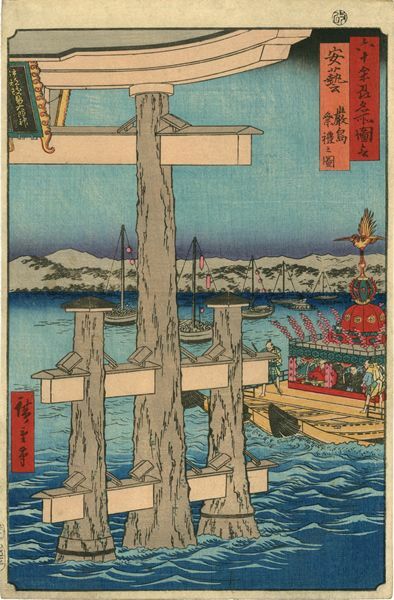 Utagawa Hiroshige (1797-1858)- The Torch Shrine in Oki Province (Oki takibi no yashiro ). From the series Rokujuyoshu no meisho zue (Pictures of Famous Places in the Sixty-odd Provinces). 1853. Oban. Van Vleck page 99. Fine impression and colour. Very good condition with narrow margin at bottom. 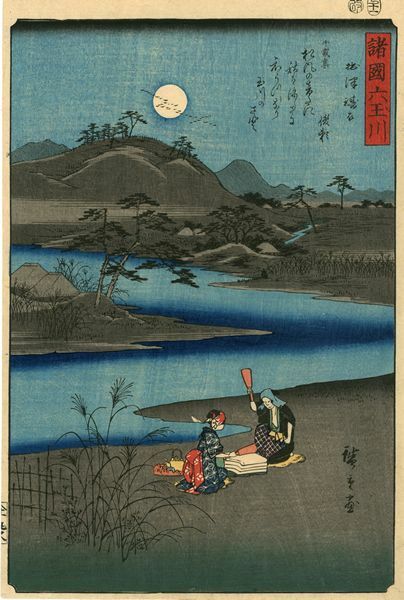 Utagawa Hiroshige (1797-1858)- Kinuta Tamagawa in Settsu Province. 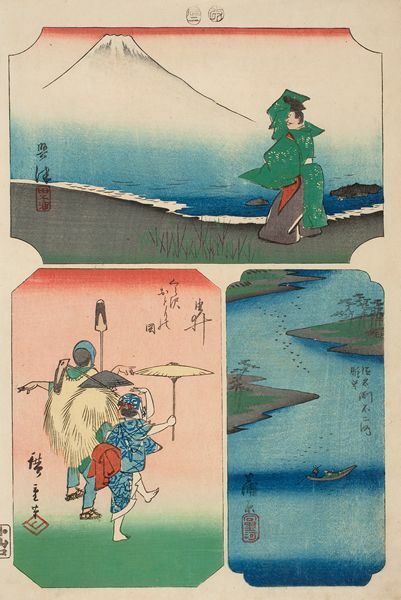 From the series Shokoku tamagawa (Six Tama Rivers). 1857. Oban. Fine impression with strong woodgrain. Fine colour. Very good condition. 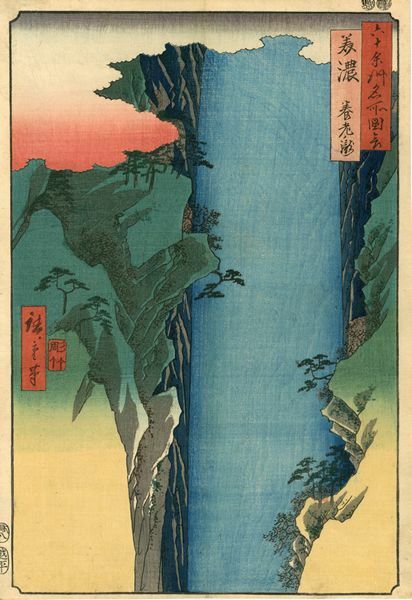 Utagawa Hiroshige (1797-1858)- Shiojiri Pass in Shinano Province (Shinano shiojiritoge). 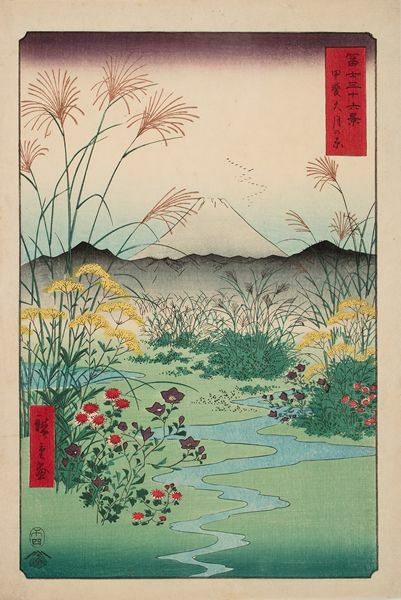 From the series Fuji sanjurokkei (Thirty-six Views of Mt. Fuji). Utagawa Hiroshige (1797-1858)- No. 1. Ichikoku Bridge in the Eastern Capital (Toto ichikokubashi) . 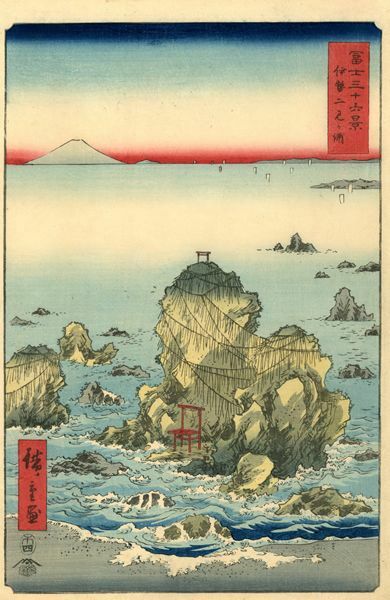 From the series Fuji sanjurokkei (Thirty-six Views of Mt. Fuji). Utagawa Hiroshige (1797-1858)- No. 30. Misaka Pass in Kai Province (Kai misakagoshi). 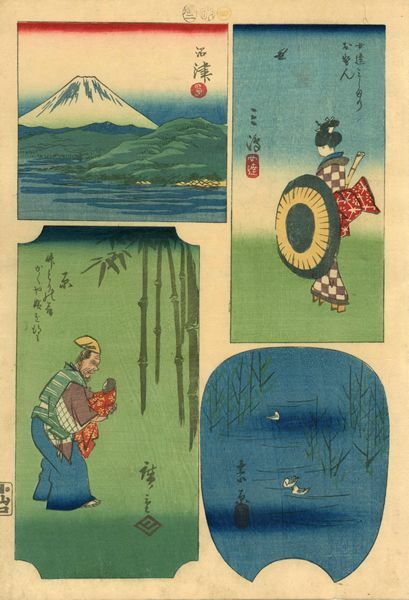 From the series Fuji sanjurokkei (Thirty-six Views of Mt. Fuji). 1858. Oban. Fine impression, colour and condition. Van Vleck page 109. Utagawa Hiroshige (1797-1858)- No. 32. Dog Eye Pass in Kai Province (Kai inumetoge). 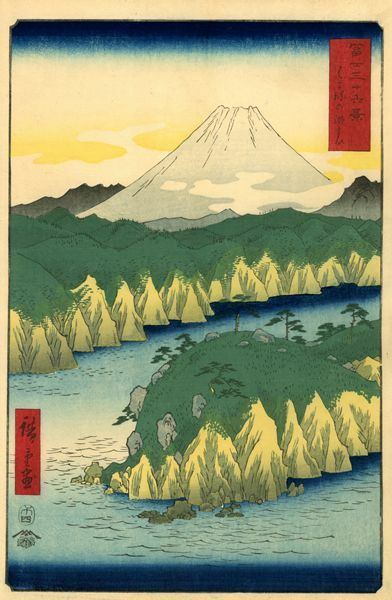 From the series Fuji sanjurokkei (Thirty-six Views of Mt. Fuji). 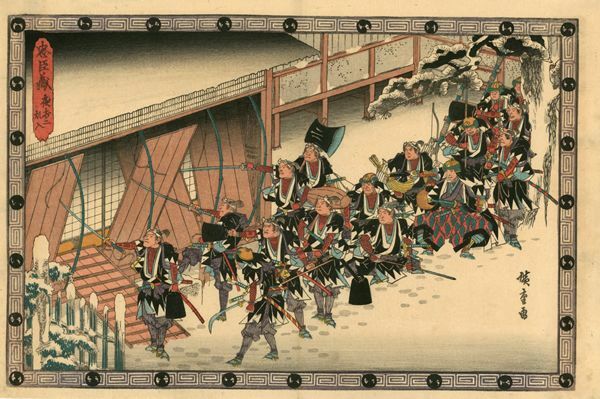 Utagawa Hiroshige (1797-1858)- The Ronin Breaking into the Inner Building of Moronao Castle in Snow. Act 11-scene 2. From the series Chushingura (The Storehouse of Loyal Retainers). Mid-1830. Oban. Van Vleck page 186. Fine, early impression. Fine colour. Faint centrefold. Very good condition. 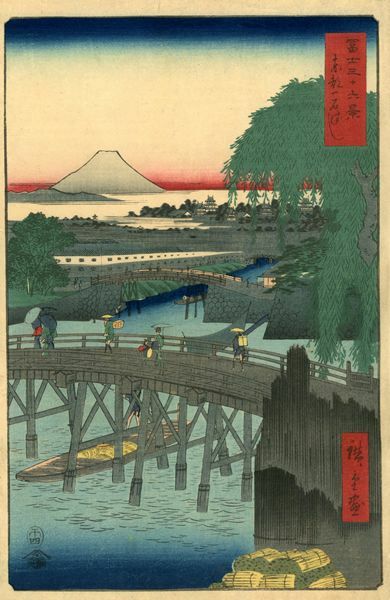 Utagawa Hiroshige II (1826-1869)- Imado Bridge and Matsuchi Hill (Imadobashi matsuchiyama). From the series Toto sanjurokkei (Thirty-six Views of the Eastern Capital). 1862. Oban. Van Vleck page 201. Fine impression with strong woodgrain. Fine colour. Expertly re-margined. Very good condition. Utagawa Hiroshige II (1826-1869)- Yushima Tenjin Shrine. 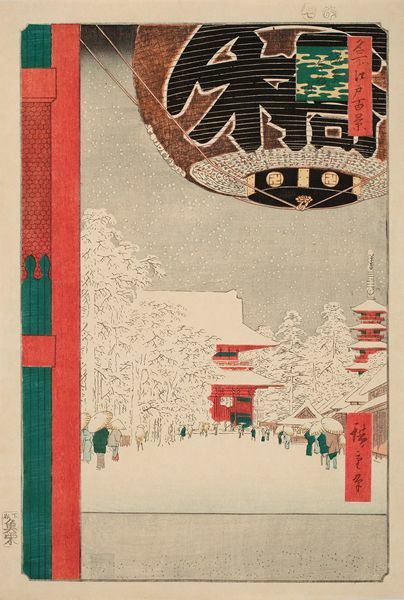 From the series Toto sanjurokkei (Thirty-six Views of the Eastern Capital). 1862. Fine impression and colour. Very good condition. Kobayashi Kiyochika (1847-1915)- Dawn at Ryogoku Hyappon-kui. 1879. Oban. Very good impression, colour and condition. 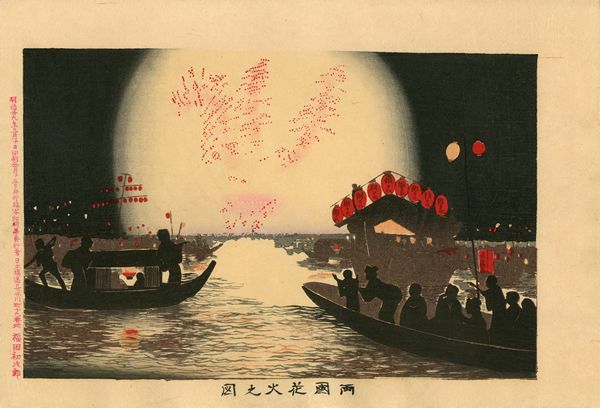 Kobayashi Kiyochika (1847-1915)- Fireworks at Ryogoku. 1896.Oban. Fine impression of the 1896 edition. Fine colour. Fine condition with large margins. Utagawa Hiroshige (1797-1858)- Twilight Hill at Meguro in the Eastern Capital (Toto meguro yuhigaoka). 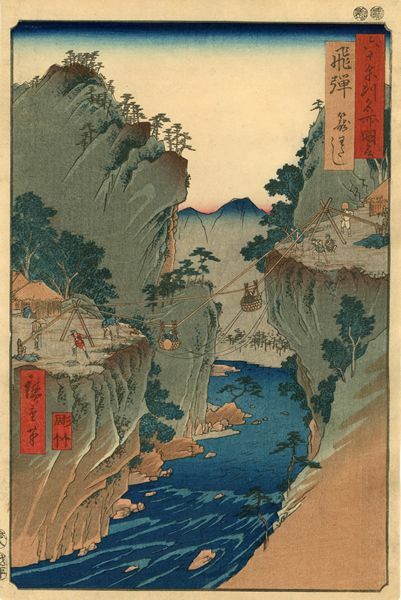 From the series Fugaku sanjurokkei (Thirty-six Views of Mt. Fuji). 1858. Oban. Van Vleck page 107. Fine impression with strong woodgrain. Fine colour and condition. 1855. Oban. 36.5 x 25cm. Van Vleck page 69. Fine impression, colour and condition. 1859. Oban. Fine impression of the first edition. Very good colour and condition. Circa 1850. Fan print. 21.5 x 28.8cm. Tamba 42. Fine impression, colour and condition with the usual slight trimming. 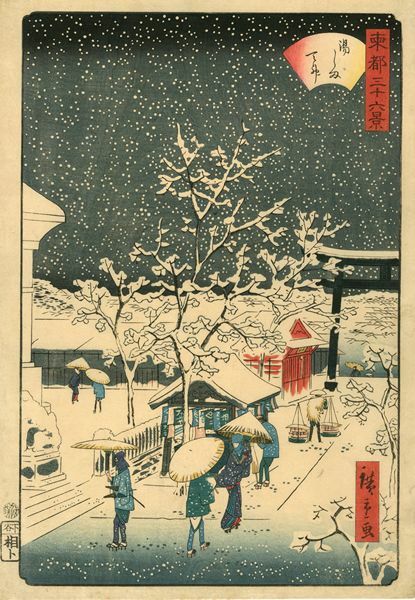 Utagawa Hiroshige (1797-1858)- Tenman Shrine at Kameido in Snow (Kameido Tenmangu keidai yuki). From the series Toto meisho (Famous Places in the Eastern Capital). Mid 1830s. Oban. 25.1 x 38.3 cm. 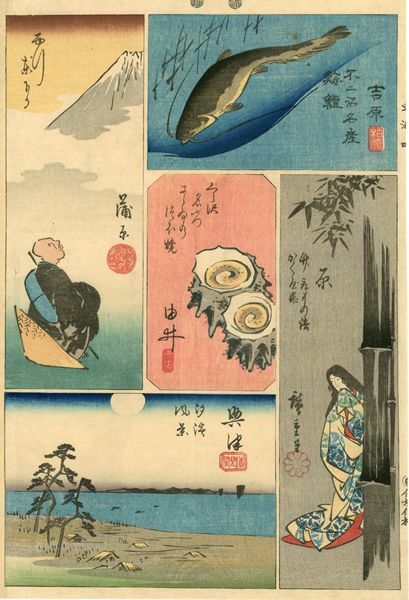 Suzuki 12, Tamba 188, Hiroshige: The Collected Edo Landscapes no. 485. Fine impression, colour and condition. (Asakusa kinryuzan shita azumabashi uchibo). From the series Toto meisho (Famous Places in the Eastern Capital). Ca. late 1830s. Chutanzaku. 38.5 x 12.8 cm. 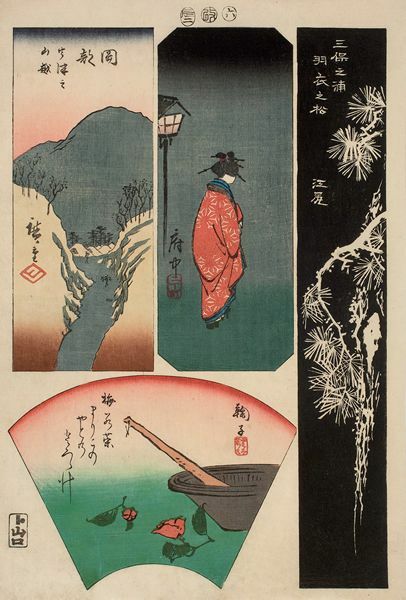 Van Vleck page 147, Hiroshige: The Collected Edo Landscape Prints, no. 1028. Fine impression, colour and condition. 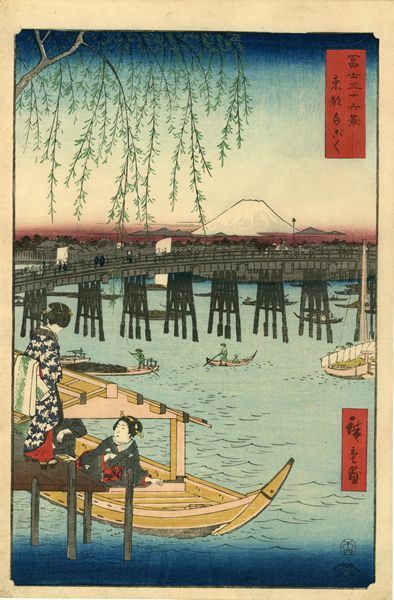 Utagawa Hiroshige (1797-1858)- Pleasure Boats at Ryogoku Bridge in the Eastern Capital-a Triptych. (Toto ryogoku yusen no zu-sanmai tsuzuki). Early 1830s. Oban triptych. 38.6 x 77.1cm. Baur, Vol. II, G-469. 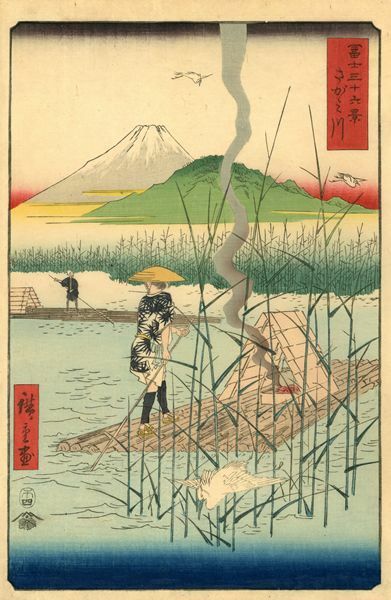 Hiroshige: The Collected Edo Landscapes no.402. Fine impression, colour and condition. Rare. 1860. Oban. Fine impression, colour and condition. Mid 1830s. Oban. Van Vleck page 82. Fine, early impression with blind-printing in the water. Fine colour and condition. 1856. Oban. Van Vleck page 179. Fine impression with woodgrain and over-printing. Fine colour. Very good condition. 1856. Oban. Van Vleck page 179. Fine impression, colour and condition. 1856. Oban. Fine impression and colour. Very good condition. 1856. Oban. 36.8 x 24.8cm. Van Vleck page 180. Fine impression, colour and condition. Oban. 36.7 x 24.8cm. 1856. Van Vleck page 180. FIne impression, colour and condition. Oban. 36.6 x 25.4cm. 1856. Van Vleck page 180. Fine impression, colour and condition. From the series Kyoga gojusan-tsugi no ichimai (One Sheet from the Fifty-three Stations in Comic Pictures). 1866. Oban. 37.1 x 25.1 cm. KKM, 1990, no. 135. Exhibition of Kawanabe Kyosai’s Prints and Illustrated Books from Fukutomi Taro Collection, Riccar Art Museum, 1987, no. 85 (this impression). Provenance: Fukutomi Taro. Fine impression, colour and condition. From the series Tokaido (Tokaido Highway). 1863. Oban. 37.1 x 25.4 cm. 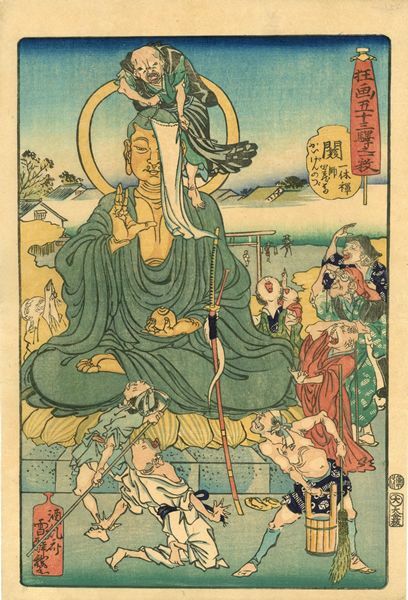 Clark, Demon of Painting: The Art of Kawanabe Kyosai, no. 73, KKM, 1990, no. 77. Fine, early impression. Fine colour and condition. From the series Tokaido meisho no uchi (Famous Places along the Tokaido Highway). 1860. Oban. 35.5 x 23.5 cm. KKM, 1990, no. 81. Fine impression and colour. Very good condition. 1866. Oban.37.1 x 24.8 cm. KKM, 1990, no. 136, Exhibition of Kawanabe Kyosai Prints and Illustrated Books from Fukutomi Taro Collection, Riccar Art Museum, no. 87 (this impression). Provenance: Fukutomi Taro. Fine impression, colour and condition.